How long it takes for hot water to come flowing out of your faucet or showerhead can depend on a number of things. First and most obvious, it can depend on your hot water heater. It can also depend on the size of your home or how far the water has to flow through the pipes before it comes out of the faucet. As the water flows while you’re waiting, you’re wasting water, time, and money. Using a hot water recirculating pump can change that. These units pump cold water back to the water heater, which ensures that the water is nice and hot when it reaches you. We’ve narrowed down the best hot water recirculating pumps, so if you’re tired of waiting on cold water, keep reading. Even with the best hot water recirculating pumps, there is a lot of variety that can be offered. This is why we’ve taken the time to research and try as many hot water recirculating pumps as we could, to narrow down the list and help you find the very best options for your home. From research and trials to the consideration of hot water recirculating pump reviews, we managed to find the following top picks. If you want to know more about our process and how we chose the best hot water recirculating pumps in this article, you can check the sections below our picks. We fill you in on our research methods and what allowed us to narrow down our choices to the ones you find here. 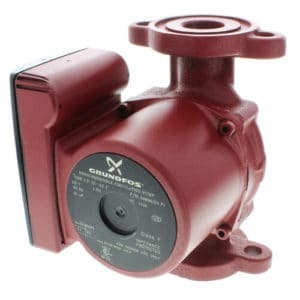 The Grundfos Comfort System is a top of the line hot water recirculating pump. This model is energy efficient, requiring only 25 Watts of electricity. Installation requirements are minimal and should be able to be completed within a couple of hours. Thanks to the bypass valve that is included, a return line won’t be necessary, and you won’t need electric running under the sink. Instead, you can install the Grundfos Comfort System on top of the water heater at the hot water discharge. Grundfos is a name you can trust, and they are willing to back that up with a two-year warranty. The motor is quiet, which means you can leave it running full-time. If you don’t want it running non-stop it can also be controlled via a timer or aquastat. Using these automatic features means you’ll use less energy. You can determine how to set your 24-hour timer based on when you use the most water in your home. The warranty alone makes this Grundfos Comfort System worth considering. It’s longer than most. Offering automatic timers and an energy efficient motor, the Grundfos Comfort System is one of the best options on the market. Not only that, with the money it saves in energy and water use, it could end up paying for itself. Click here to learn more about the Grundfos Comfort System. The name Grundfos is well known and has a reputation that you can trust. The SuperBrute serves as one of their budget models. 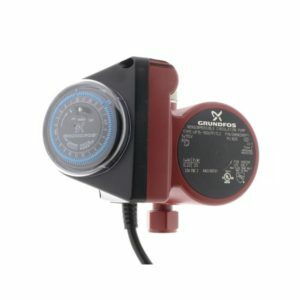 Despite costing less, this hot water recirculating pump gets the job done. You shouldn’t have problems pumping water throughout your home with this pump as it has a water flow rate of 15.5 gallons per minute. Like other Grundfos models, this pump is energy efficient using only 25 Watts of electricity, which is less than the average light bulb. The motor is encased in cast iron housing and the pump is a combination of stainless steel and bronze. While it is undoubtedly powerful, it is equally quiet. The only downside with the Grundfos SuperBrute is actually the thing that makes it so much cheaper. That is the lack of automated features. Still, you can purchase a heat sensor shut-off and/or a timer as additional add-ons. It would be hard to find a better hot water recirculating pump at this price. Click here to learn more. The Taco 006-B4 might not look like much, but the Taco brand is known for their dependability. One of the first things you might notice about this pump is the unique design features. The cartridge holds all of the important parts. It can also be replaced. This is likely to save you money in the long run, as if something goes wrong with the pump, you would only need to replace the cartridge as opposed to the entire unit. 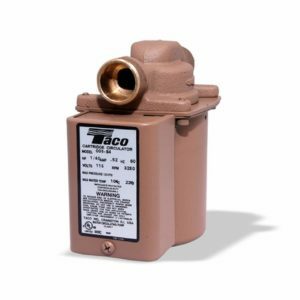 Like many pumps on the market, the Taco does not have an automatic timer feature. As such, if you want this feature, you’d need to add it. If you do decide to add one, you’d have your pick of the timer Taco offers or you could use a reliable third-party option. Whichever option you choose it would be simple to install. This under-the-sink water heater will provide a reliable option that requires little maintenance, for the most part. It is a solid option that will help to ensure that you have hot water on the ready, which will lower your water bill and help to cut down on water waste. Click here to learn more. Water conservation – The term behavioral waste refers to waste that occurs due to human habits. One of those human habits involves the warming of water. When you turn on a faucet, you have to wait for the water heater to warm it. When you turn it off, the process needs to be repeated again. In fact, 20% or more of every shower is water waste. Other estimates list the waste as high as 30%. This means that in America alone as much as 200 billion gallons of water is wasted per year. A hot water recirculation pump can ensure that less water is wasted while you’re waiting for things to warm up. Lower Water Bills – One of the easiest ways to lower the price of your water bill is to use less water. While some of that can be fixed by updating plumbing or faucets to be more efficient, in this context, it’s more about not having to waste water waiting for it to warm up. Depending on the amount of water you’re wasting, you could save hundreds of dollars or more each year and help the planet at the same time. It’s a win for everyone, especially your pocketbook. Ease of Installation and Operation – The best hot water recirculating pumps are relatively easy to set up. Most of them can be installed with standard tools, most of which you likely already have in your tool box. Likewise, operating a hot water recirculating pump is easy to do. Product Specifics – Not every hot water recirculation pump is made the same. With that in mind, there are pros and cons that come with each product. We researched the various types of pumps to determine the effectiveness of each one. We looked at both under-the-sink and over-the-water heater styles and considered how each model would work in a variety of settings from a single-family home to something smaller like an apartment. Reviews – While the bulk of our choice was made through research and testing that was done, we also took into account hot water recirculating pump reviews from verified customers. This allowed us to attain a broader perspective of each product we looked at. It also helped us to gain different opinions and experiences of each product in different settings. Value – Prices will vary and that’s one of the things we considered. More specifically, we considered if each hot water recirculating pump seemed like it was worth the cost. We looked at the features and what comparable models’ cost. Another consideration had to do with whether there was a warranty, how long it would last, and what protection you had from risk after purchase should anything go wrong.